The strange system the pyramid builders and/or the ancient Egyptians used for measuring has been bothering me for a while. On the one hand, we have the logical divisions of the cubit, into nice 15cm chunks and smaller, while on the other hand we have the royal cubit as π/6 which is a horrible irrational number. So on the face of it it seems odd that there should be some relationship between a cubit at 0.4500m and a royal cubit at 0.5236+ m. The difference is 0.07356+, and trying ratios does not get us very far. But my intuition was insisting that there must be some easy connection between the two. So I played around a bit, and noticed that cubit/royal cubit was around 0.8594, which rang a bell, as 0.5236 x phi is 0.8472. I’ve rearranged the formulas in Cubit parts and more, updated to be sorted by the general method used. This shows the patterns between the different divisions better. 2019-01-15: Added formulas for “double pole”, standardised a lot of the formulas to use same denominator, to better show link between formula and number of digits, added page for formulas based on e/π∛3, added tau-equivalent formulas to pi page, added inch, and assorted minor tweaks and corrections. While playing around with the calculator, I stumbled onto the very close identity, where ln(4) plus royal cubit is very close to inverse of the royal cubit. A bit of rearranging of this identity, replacing the royal cubit by x, allows us to solve for x using the high-school quadratic formula, and thus get a very close approximation for the royal cubit… there are five zeroes after the decimal point if we subtract the royal cubit from the answer. 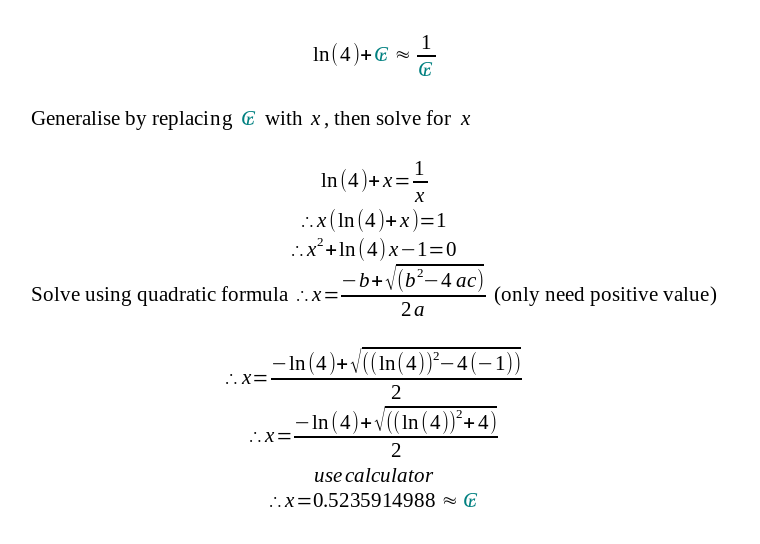 Getting the royal cubit from a simple quadratic equation. The difference between x above and ₢ (as π/6) comes out at -0.00000727677051. To borrow a phrase from Robert Bauval, this falls under the Spooky Stuff category. It is a very strange connection between the Grand Metre (1 + royal cubit), the base of the natural logarithm ⅇ, and the royal cubit as measured in inches. As previously shown (here and here), φe/8.4 is a good approximation (0.5236) for the Royal Cubit. But, you may ask, what’s so special about 8.4? Well the 8.4 is actually the simplified version of the numbers that came out when deriving the relationship. But we can go in the other direction as well, and explode 8.4 into various components and equivalent fractions. Which looks pretty innocuous until you see that for practical purposes, as on a ruler, it’s effectively equal to 1. The actual value is about 1.00000970264. While playing around with my calculator in recent times, manipulating pi, phi, e, and the cubit e.t.c., I sometimes ended up with an answer of 1.199981615 which is extremely close to 1.2, and I thought that was interesting. Eventually I took note of the formula to get there, and then realised that 1.2 m is 4 Egyptian feet … and then the penny dropped. From the foot, we can double to the pole, or half to the double handbreadth. A bit of playing around revealed reasonably easy adjustments to give other fractions of the cubit, all based off the same ratio, which is simply pi over (phi squared) = π/φ². It is the mainstream academic consensus that ancient people based their measurements on body parts. As discussed in Some thoughts on the cubit (and foot) , I don’t think that’s necessarily so, despite at least two (the Persian and Roman feet) at one point being based on the length of the foot of their leader (or his over-sized statue). I still think the names that these measurements became known as (cubit, foot, palm, etc) were backnyms to create a easy-to-use-and-remember name for a length. Even something simple like measuring the width of a hand is not exact because fingers move, flesh compresses, etc., and fingers are not all the same width. 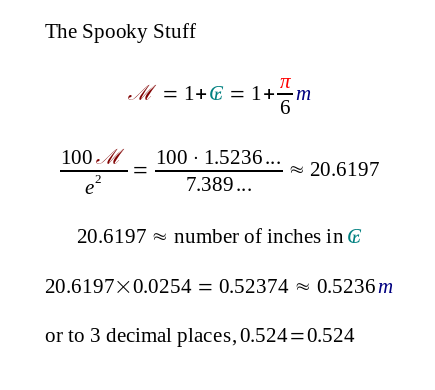 So… here’s a little exercise to show that we can get the same list of parts of the cubit just with maths. In some cases two different methods produce values on either side of the target.